Just a quick post today. 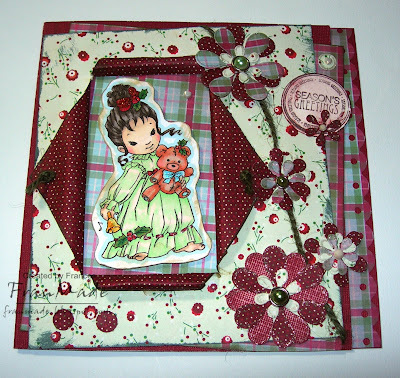 This is a folder card I made last night, which is the challenge over on Sukkersött this week. This is the first time I've joined in, only because there just isn't enough time in the week to do all the challenges I would like to! 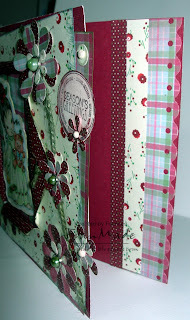 Also, I have used 3 different ribbons which is the challenge over on spoonful of sugar this week. On the subject of making my day, I've just had the most wonderful post today - my Whiff of Joy DT packet arrived - whooohooo!!! Wait till you've seen them all ladies (9 of them in total!! ), they are just all sooo scrumptious. You need to start stalking the other DT's blog as I know quite a few of us have got them (links on my sidebar, near the top) and I'm sure they'll all whip something up very soon. I would too if I didn't have to work tonight! :( Hopefully will have something to show you soon. Until then, have a rubba-tastic weekend! Tilda& Co - 'hands' : station platform . . .
Colouring: all watercoloured with distress inks and a touch of gold shimmer paint on the suitcase and handbag handles. Background all stamped directly onto paper using masking technique although I had to hand draw bits of the wall to finish it off. 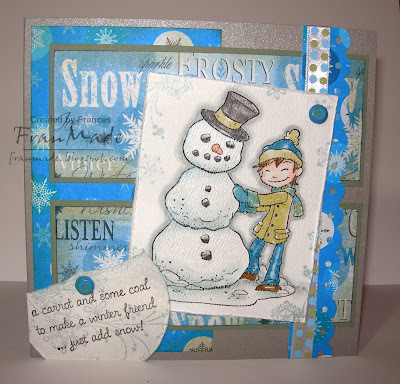 All stamped with 'Smokey grey' Versafine inkpad as I wanted more faded look. 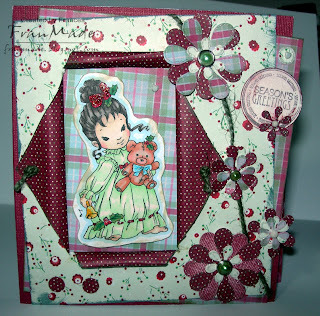 Others: diamond glaze over clock face, ribbon, flowers, brads from stash. Used Heidi Swapp distresser round edges of image. Here's a close up of Tilda & Edwin and the clock to show how they are raised on 3d foam pads, Edwin's is slightly thicker so stands out more. I was going to stamp a little sentiment in top left bit of sky but decided to leave it off until I use it and then decide then. Thanks Rach! I would like to give this award to everyone on my blogroll and all the DT teams I'm on, for the reasons given on the award itself - you all inspire me with your creativity and art and have all become great blogging friends and for that, I thank you! I will try and remember to mention it when I next visit you all over the coming week, but if you see this first, please feel free to take it! Fab sketch by Carole this week over on Fri sketchers. Lovely simple one which I love. 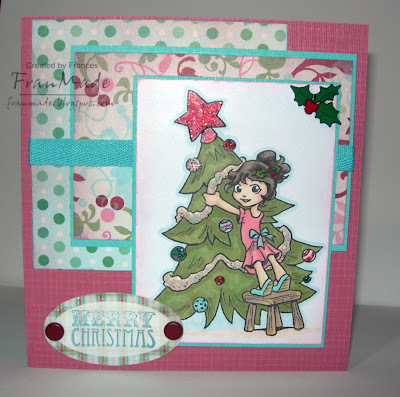 Have whipped up quick christmas card with another Whiff of Joy stamp. I love this Charlie one as the doggy is just so comical and it doesn't have to be used for christmas, even though I have! I've not ticked the box of whether naughty or nice until I know who the recipient is! 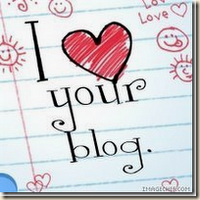 Talking of Whiff of Joy have you seen the latest news over on Katharina's blog? 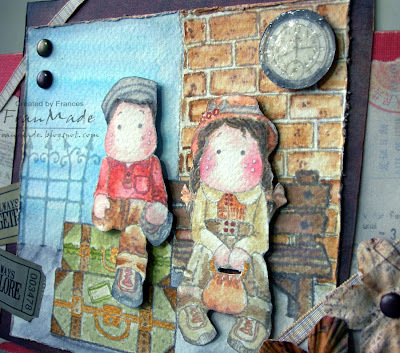 It's the long awaited release date for the range of stamps by Elisabeth Bell. The date to put in your diaries is 3rd Sep, as I just know there will be a stampede for these beauties. 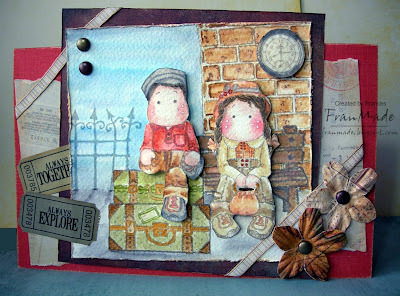 For details visit Katharina's blog or the webshop. Also, before I go, must mention this award I got off the lovely Diane! Thanks lovey, really appreciate it :) I've already passed this award on (here, if you're interested) so won't do it again if that's alright with you. On the 7th day of Christmas . .
. . my true love gave to me . . . (I can hear you all humming it trying to remember :), I always get confused what goes where after '5 gold rings' LOL). . it's 7 swans a swimming. No I've not gone mad (not totally!) 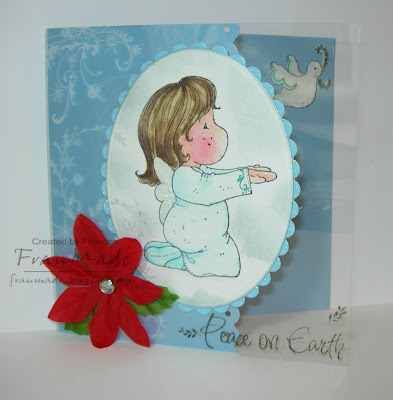 but this week's CCT theme is 'in the water' and I decided to use 1 of the stamps from my PB '12 days of Christmas' clear set. This was after I was piped to my first choice of stamp by another DT (you know who you are ;/), who have all come up with fab ideas for 'in the water' and you will need to check out but not before you've read to the end o.k? It's not an obvious or traditional christmas card but I think they make great fun cards and can be whipped up really quickly. Not much to this card really, I wanted to incorporate the 12 days song so typed it up in powerpoint into a circle and printed straight onto A4 card which I turned into my cardbase. Then image was just coloured (what little there!) 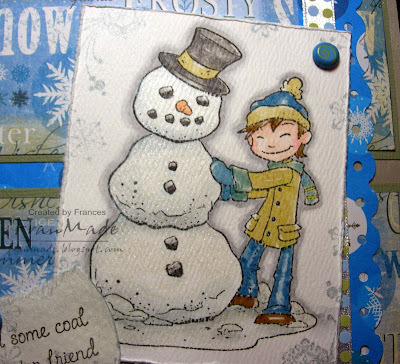 with distress inks and cosmic shimmer (click on photo for close up) and cut and layered onto dp with my circle nesties. 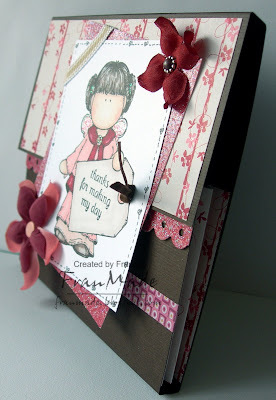 Sponged the edge of the circle and the card base with some red chalk to soften the edges. 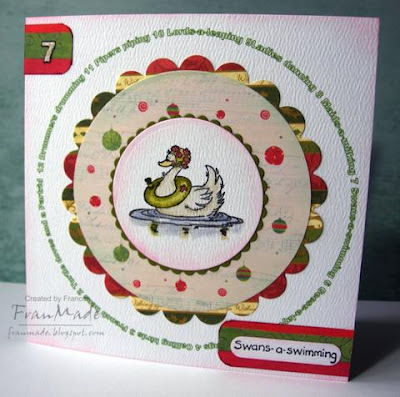 The '7 swans a swimming' come with the set and all the sentiments are seperate to the image which I think is brilliant as it makes them usable all year round. That's all for now. 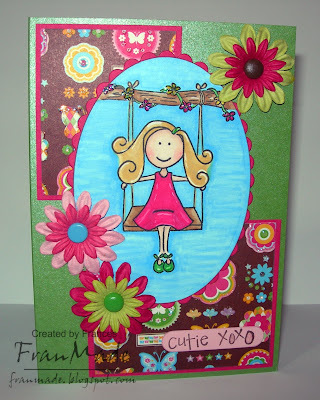 You can pop on over to CCT now and see the other cards and the fab watery themed candy on offer this week. Papers: PM 'naughty or nice' christmas pack. For those wondering where my ATCs have gone to, it's because there was 1 theme for the whole of Aug and I showed them all a couple of weeks ago but new theme will be up next week so check back then - it's scary how fast this month has gone, but then again, maybe not for those that have had the kids at home all this time ;), not long to go now before your little darlings are back at school! Have been spending too much time internet window shopping (hence no card yesterday!) and have noticed lots of new christmas ranges coming out from all the various stamp companies - Ughhh, it's getting sooo hard to decide which ones to get, then just when I'm trying to prioritise I see that Penny black are retiring some of their older Christmas stamps and some are ones I've wanted but thought could wait but now I'm thinking I best get them before they dissappear and go for silly prices on ebay! 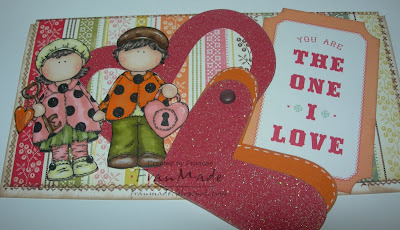 Right, must pry myself away from the PC and go make some cards to justify getting more stash, LOL! 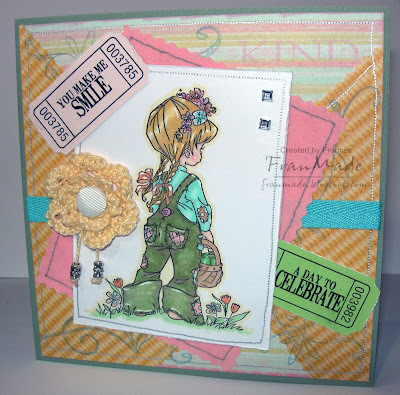 PTW challenge was a lovely sketch by Katharina, so it was only right that I used another of my Charlie stamps from Whiff of Joy, even if I am a bit late! Others: ribbon & brads from stash. Fiskars threading water border punch and heidi swapp distresser tool used. Tried to take close up to show shimmery-ness (I know no such word, just made it up!) of snowman but it's impossible to capture it! 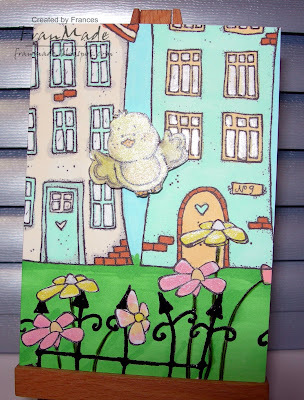 Finally used one of my new Tildas, this one's 'heavenly Tilda' and the dove is Magnolia too. This Tilda is BIG, doesn't look too dainty when you stick her next to the others LOL. 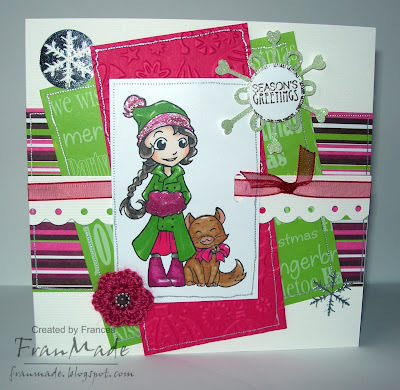 Been dying to use my Inkadinkado christmas flourish stamps on acetate, finally got the chance to use it for this card. Tilda (coloured with distress inks & cosmic shimmer paints) really shimmers IRL but it's o hard to capture on photo. Here's a photo of the card closed . .
Have another late card to post (for PTW) but it's well past my bedtime now, so will save that for tomorrow and will try and do some blog visits too, assuming DH doesn't get too underfoot ;p! 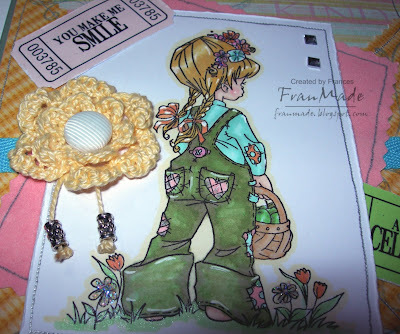 Others: crochet flower by moi, ribbons, brad & charms from stash. My sister who never passed her English the first time round back in the days of CSEs & O levels (so you can work out how long ago THAT was lol) passed her English GCSE today, whoohoo. I couldn't believe it as we are always laughing at how shocking her english grammar/spelling is at times -just goes to show it's never too late! 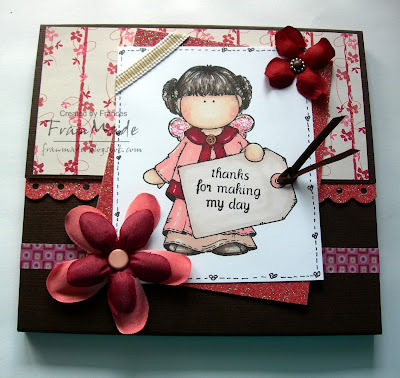 So this card is for her as she loves precious moments too. Our 16yr old nephew slightly eclipsed her though with his 6A*, 6A & 1B :) Hope all you with 16yr olds got the results you wanted/expected. Anyway, here's my card which I'm not very happy with but ran out of time. I think it's because I tried to rush it and I shouldn't have coloured all the sky in but you know when you start something and then it's too late to stop! I do love the elzybell girl though and hopefully I should have some of the christmas ones soon (you know I have a weakness for cute stamps LOL). I think they suit more simple clean layouts which is something I need to work on, especially when all my latest cards have been lots of layers and embellies it's hard to get out of that mindset. Sarah Kay wkly: Charming crochet?! Managed to take part in a Sarah Kay challenge this week (I keep running out of time!) and luckily this weeks theme was to use charms which made it easier as I didn't have to tax my lil brian to get my bits to fit a sketch! As I've mentioned I've been making more crochet flowers and experimenting with different thickness of yarn as I've been struggling to find nice thiness cotton crochet yarn in pretty colours (any suggestion anyone?). I have very thin in some pastel colours but I wanted more colours in a slightly thicker gauge but what I got is a tad too thick and gave me a whopper of a flower! However I wanted to use it so based my card round it as it matched the bit of scrap DP I had left over from the other day. Sarah Kay stamp (yeah, I've used them all now :) ) coloured with promarkers, papers are Cosmo cricket 'Honey Pie', charms and metal embellies from candy I won off Camilla (must find some more, love them! 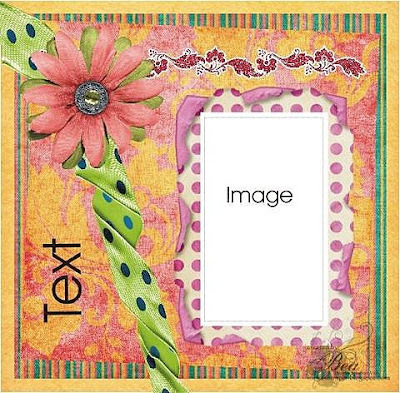 ), flourishes are an Inkadinkado clear stamp set. Did you see the 200m men's final yesterday? A-mazing! 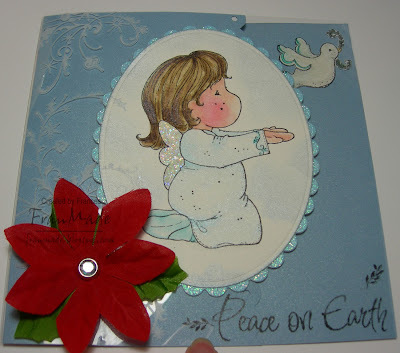 A quick card tonight as I spent far too long glued to my pc this afternoon (and also been naughty and bought some Elzybells christmas stamps). Here's another card for spoonful of sugar, which this week is a sketch challenge and I'm early for a change (if you knew me you'd know that's VERY unlike me!) LOL . 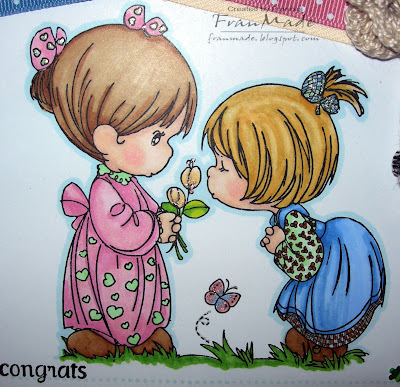 Also you can use any brand of stamp for their challenges now so I had to ink up another of my fab Charlotte & Charlie stamps from Whiff of Joy. Right, off to watch the Olympic highlights - GB are doing so well, highly unusual for us LOL. Hello! Hope you've all had a lovely weekend even if we are having a non-existent summer! It's been raining on and off here and have you noticed it's turning dark earlier - how depressing! Anyway, I've only made the one card tonight as I made the mistake of re-arranging bits on my desk and don't you find that once you start everything kinda explodes and I had a tough time trying to find homes for everything again! Didn't make any over the weekend as I've been watching the Olympics and also making more crochet flowers as I've got the hang of them now (turned out my earlier efforts weren't actually correct as I got some of the stitches wrong but don't think you can tell lol). Enough talk, here's the card. It's for spoonful of sugar challenge which ends in about 30mins so I best get my skates on! The theme was 'a secret message' so I thought I'd make anniversary card for hubby seeing as it's our anniversary this Friday (8yrs). H&S images (thanks Nikki!) coloured with promarkers, cut out and raised on 3d foam. 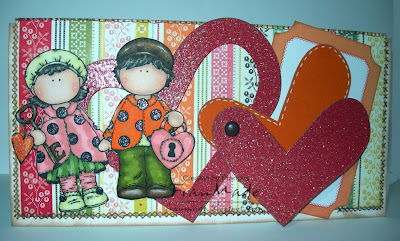 DP is cosmo cricket 'honey pie', some red glitter card and a sizzix heart die used. Added some stardust glitter pen over the spots and also faux stitching around the edges and that was it. 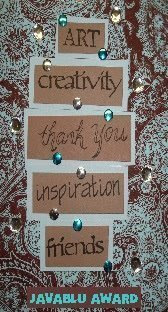 It was refreshing to make a card that wasn't square for a change! 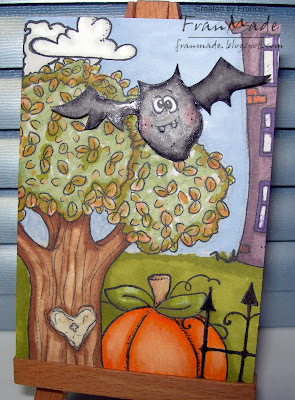 Hopefully he'll like it as he likes most of my cute cards, it's the 'arty' ones that I don't get much reactions too! Real quick post today as off to work in a minute (literally!). Made birthday card for hubby's bro (who works for Cathay airline) using the PB sketch challenge this week. 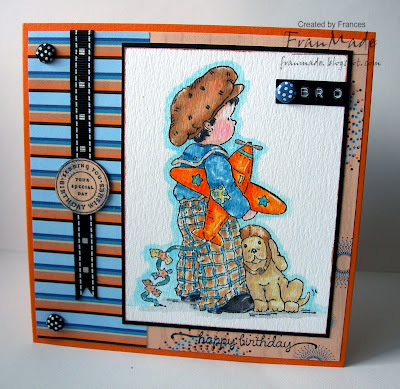 Have coloured using distress inks and H2os for a change, stamp is an old PB called 'fly away' . Now I must too! have a fab day. Others: flowers cut from Cuttlebug die (I've been thinking about getting the EK success retro flower punch but didn't realise I had these dies which seem to do a similar job - really must use what I have more!) 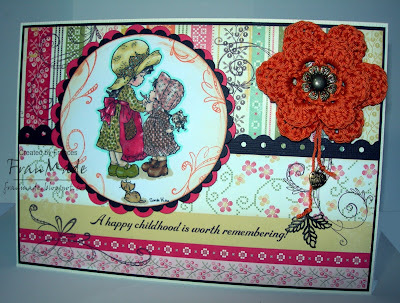 Fiskars threading water border punch, brads, garden twine and anything else I've missed from stash! 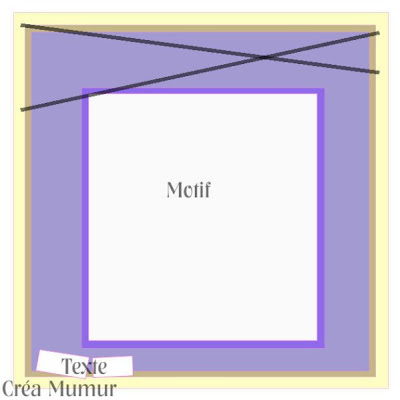 Theme this week over on CCT is soft furnishings so we want to see things like ribbon, lace, velvet, fabrics, stitching etc anything you might find on soft furnishings round the house. 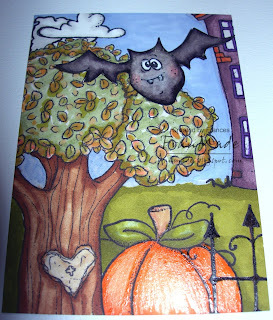 This is to tie in with the stamps that are on offer as candy this week (see CCT for details). The colours are much softer and muted in real life but my photo skills aren't very good! I gave crocheting another go the other night when I had a break from making cards. Tried another pattern this time and was quite pleased with the result seeing as I am complete novice at it. 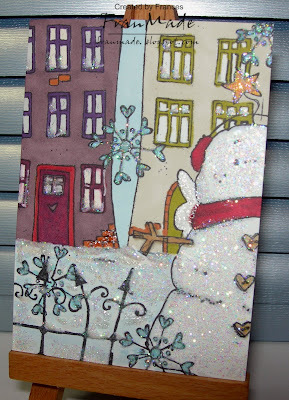 So thought that would make a good starting point for my card as it fitted with the theme. Then I found a fabric brad, some dp which was faux knitted fabric, some pink velvet paper and added some ribbon and faux stitching for good measure. It is one continuous scene but I have used different shades of colours to reflect the changing seasons. 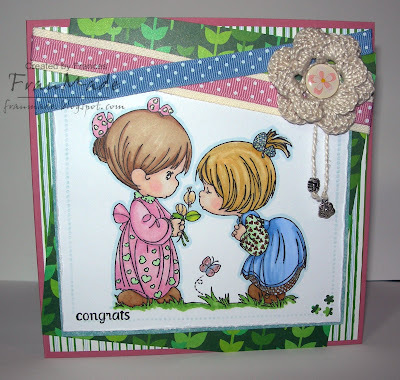 Really must try to play with my magnolia stamps more I think. Have been neglecting them of late and I have just seen the new school and heavenly stamps and would love some of those too! Received this fabulous award off Bernie and Gill. Thank you so much ladies! I'm gonna have to get back to you on this one - it's gonna be hard to whittle it down to 7! No cards today either, I'm feeling my mojo is on the wane at the mo, as I only coloured in the rest of my ATCs last night (just need to photo them and will post tomorrow) and couldn't muster anything else up. So I think I will give it a rest today and see if that will do the trick. Charlotte & Charlie let loose! PTW, cool yule: My first Whiff of Joy DT card!!! Hello & good post weekend!